Reduces fine lines & tightens skin from aging, swelling, bruising post op, and swollen ankles from edema. Stimulates toxin elimination, and cell growth. You will quickly see the benefits of European Skin Care as you plan a conscientious skin care regime with one of our experienced estheticians. Our professional skin care services, geared to your individual skin care needs, promote wellness and a healthy and transparent complexion, while they simultaneously soften environmental effects and other contributors to aging. Moments of rest and relaxation are essential to European Skin Care treatments that are designed to bring calm to your body as well as your soul. ATZEN Lymphobiology® Treatment Series – Transforms your complexion. Minimizes the appearance of wrinkles, dark circles, and scarring. Eliminates redness and puffiness as toxins are expelled and your skin is prepared to absorb critical nutrients with each gentle, relaxing Lymphobiology® treatment. During each treatment your skin is hydrated with the deeply nourishing ATZENs European Skin Care Serum. A series of ten treatments is recommended over five weeks or included in your facials. The improvements are immediate and continuous throughout the series. Lymphatic drainage reduces fine lines & tightens skin from aging, swelling, bruising post op, and swollen ankles from edema as well as stimulates toxin elimination, and cell growth. Classic Facial – This individually customized facial treatment begins with a complete skin analysis followed by deep cleansing, exfoliation, facial and neck massage, extractions if needed, and ends with nourishing hydration. European Spa Facial – This 75 minute facial provides the fundamental care needed in any regular skin care regimen. This facial begins with a thorough cleansing, a toning facial massage, and dermal steaming for deep-pore cleansing with extractions. Next the ATZEN Lymphobiology® treatment provides a relaxing and gentle experience that detoxifies and increases skin hydration and improves elasticity as it prepares your skin for a customized mask. Stress-relieving massage of the neck, shoulder, hands and feet with warming slippers add another layer of calm to this extraordinary treatment. Teen Facial – This treatment includes an extensive skin analysis and consultation along with instruction for proper skin care. The facial includes Purifying cleansing tailored to young skin with acne treatments available as needed. Gentleman’s Facial – Leaves your skin looking healthy and energized and shaving will be smooth for days. This 60 minute treatment includes a skin analysis and the fundamentals of a good skin care regimen—deep cleansing, exfoliation, and a toning massage of the face with a relaxing and stress-reducing massage of the neck and shoulders. Mini Facial – This facial includes everything in our classic facial, just for less time. This is a quick, on the go, affordable facial and is great for clients new to the facial experience. This treatment gives you a taste of the full facial and introduces you to our product line, Eminence Organics. Back Treatment – Pamper your often ignored back with this 45 minute high intensity treatment that includes cleansing, extractions of blackheads, exfoliation, toning massage, and deeply nourishing hydration. Body Wraps/Body Wrap Series –Enjoy the full and dramatic improvements from a series of body wraps. Our body wrap service includes an infrared sauna session followed by a cleansing body exfoliation scrub and then a detoxifying mud wrap leaving your body silky smooth and free of toxins. Consistent with our Green Spa status, Nushka’s Spa is proud to use Zoya vegan friendly non-toxic polish and gels. Ultra long-wearing and FREE of formaldehyde, formaldehyde resin, toluene, camphor, dibutyl phthalate, TPHP, parabens, xylene and ethyl tosylamide. Zoya is the HEALTHY COLOR of fashion! Enjoy a long soak, thorough exfoliation, heated soothing massage chair, anti-bacterial pipe free jets, and clean air. Athletes and dancers, garden feet, and nails damaged by fungus are all welcome. We are very gentle with diabetics and arthritis. All of our nail care is performed on the natural nail. We use only body and earth friendly products. We care deeply about your health and with that in mind, we use a pipe free plumbed foot bath to avoid any infections. Spa Manicure – Our natural nail manicure includes a luxurious and relaxing hand massage with moisturizing oils, thorough cuticle care, shaping and high buff shine or polish. Spa Pedicure – Our spa pedicure includes a long soak, nail care, a thorough exfoliation followed by a relaxing massage with moisturizing oils. Choose a high buff shine or polish. Enjoy a calming chair massage and a glass of wine while you unwind. Deluxe Pedicure – Our deluxe pedicure is the ultimate pedi treatment. Sit back, relax and sip on your wine while your legs and feet receive our royal treatment. This special pedicure’s perks include warm towel wraps, an extra long massage and a deeply hydrating foot and leg mask leaving your skin silky smooth. Long Lasting Gel Polish – We offer long lasting gel polish from Gelish and Madam Glam. This is a polish like you’ve never seen before! Easily applied and cured under a LED light, gel polish offers 14-21 days of chip-free, ultra shiny and vibrant color. Your polish will be completely dry at the end of your service. You can search for your wallet, take your keys from your pocket or even replace your shoes after a pedicure without the worry of chipping or smudging. Gel products are terrific alternatives to potentially unhealthy artificial nail enhancements but they offer the same terrific long lasting look. Paraffin Wax Treatment- Warm your hands and feet from the inside-out during the cold weather with Paraffin Wax! Paraffin wax treats conditions like arthritis and fibromyalgia among others. This treatment acts as a type of thermotherapy that helps treat these conditions by increasing blood flow, relaxing muscles and reducing stiffness in joints all while softening and moisturizing the skin! Paraffin wax on the hands and feet is entirely natural, which makes it a great option if you want to treat skin ailments or physical pains without more invasive procedures. Eyebrow and Eyelash Tinting – Careful tinting of eyebrows and lashes creates definition to enhance your eyes. Waxing – Hair removal from specific areas of the face or body using safe and sanitized temperature controlled hard and soft wax. Skin Growth Removal – We safely remove most age spots, sunspots, and superficial skin growths and lesions including skin tags, red moles, and seborrheic keratosis using a low-powered electro surgery unit designed especially for use by estheticians. Deep Tissue Massage – Similar to Swedish massage, deep tissue massage uses deeper pressure resulting in the release of chronic muscle tension. Swedish Massage – The primary goal of the Swedish massage is to relax and ease tension of the entire body while increasing levels of oxygen in the blood, decreasing muscle toxins and improving circulation and flexibility. Pregnancy Massage – Prenatal massage focuses on the special needs of the mother-to-be as she is going through major body changes. This gentle massage therapy relieves mental and physical fatigue, improves circulation and eases the common lower back pain associated with pregnancy. Hot Stone Massage – A specialty massage where the therapist uses a variety of smooth, heated stones that can be both deeply relaxing and help warm up tight muscles so the therapist can work more deeply, more quickly. This massage therapy helps ease discomforts from fibromyalgia, chronic pain, rheumatoid arthritis, as well as promoting sleep and deep relaxation. Relax, Detox and Lose Weight at the same time! Cozy up in our single person sauna and escape from the pressures of your day. 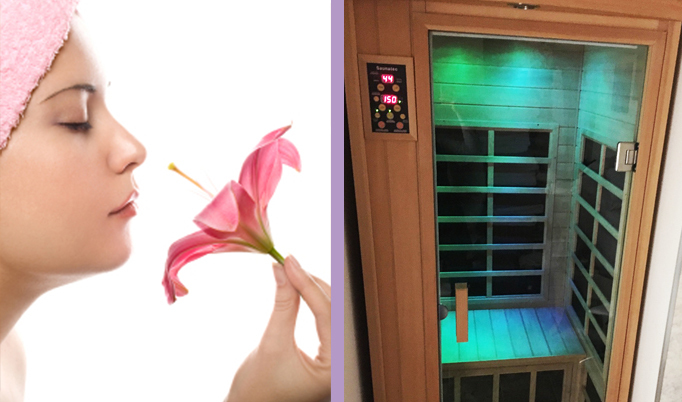 Our Infrared Sauna improves your immune system to help fight off seasonal colds while helping to improve skin diseases, control blood pressure and relieve joint and muscle pain and arthritis. You’ll leave feeling energized yet relaxed and ready to tackle the world!